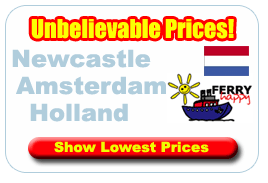 Looking for a Cheap Ferry To Amsterdam from Newcastle then look no further and book a cheap ferry to Amsterdam here online. Cheap car ferries are operated by major ferry operators such as P&O, DFDS & Stena Line. If you are looking for a quick, cheap ferry crossing to Amsterdam then the Newcastle ferry to Amsterdam is well equipped to meet your demand on this very popular route. Sailing to Amsterdam from Newcastle is so easy and you can pack as much as you can fit in your car! The overnight cruise style crossings mean you can enjoy a whole lot more leg room than other modes of transport! The sights can be rather more interesting too - you'll enjoy exhilarating sea views and fresh air as you stroll on deck. The Newcastle to Amsterdam ferry route connects the North-East of England to Northern Holland. Ferries to Amsterdam depart from Newcastle at 5.30pm and after an overnight croosing arrives in Holland at 9.30am dutch time. The crossing is served by the Princess of Norway and the King of Scandinavia ferry ships. When you arrive on your Ferry from Newcastle to Amsterdam you feel right at home as soon as you step out onto its cobbled streets. The food's a great mix of foreign and familiar & the residents are so friendly & welcoming. Amsterdam's city centre is reassuringly small which makes you feel really comfortable walking around not having the fear of getting lost. Don't bother with the stress of big city breaks visit Amsterdam & take it easy. Holidays to Amsterdam are all about letting your hair down in one of Europe's most chilled out cities. With the canals, culture & coffee shops it doesn't matter what you're looking in Amsterdam, holidays here are a sure fire hit. Inbetween taking it easy why not make time for the fantastic cultural scene Amsterdam has. There's the haunting hallways of Anne Frank's House, the superb art museum's the Stedelijk, the Rijksmuseum and the Van Gogh plus museums about everything from hash to hanky-panky. Why not picture yourself sailing down the flower fringed canals under the beautiful mansions in Jordaan area, or say taking a leisurely walk round the Old Quarter popping in and out of the shops on Kalverstraat. An ultimate Dutch experience has got to be braving all those cobbled streets on a bicycle. After all that sightseeing you then have a fantastic range of traditional bars and cafe's to do some relaxing in or why not chill out in the lively bar lined square. Amsterdam by night has perfected the art of relaxation, so just sit back and enjoy! There are so many superb museums in Amsterdam that the choice for visitors can be overwhelming. However, there is no doubt that the Van Gogh Museum is one of the best. This houses the largest collection of Van Gogh’s work, which is obviously quite remarkable. The museum itself has undergone a recent refurbishment and this has improved the visitor experience no end: There is also an option for an English language self guided tour. A walking tour of Amsterdam offers hours of sightseeing fun. Its also a great option if you are on a budget. Simply pick up a map at one of the Amsterdam Tourist Offices and choose one an area to explore. We would stick to Jordaan, the “Nine Streets” of the Central Canal Ring, Oude Zijde or the Eastern Canal Ring and its stately mansions. There are over 1,000 bridges in Amsterdam and an opportunity for a photograph around every corner.